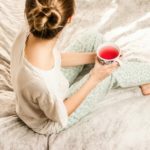 Most of us gals don’t consider sleepwear a luxury item, but then again, a lot of us might not be getting the best sleep of our lives. Luxe sleepwear from brands like IN BED might seem like an overindulgence, but when it comes to getting quality sleep, it’s well worth the investment. Find out the six most expensive types of sleepwear for women that are not only worth their extravagant price tag, but a smart choice for your health and happiness. The ultimate in indulgence, good cashmere should cost you a pretty penny but it’s unlike anything else you’ll own. Luxurious, lightweight, unbelievably soft and cozy, cashmere is never a bad investment into your self-care. Cashmere lounge-wear is the best combination because you’re covered head to toe in dreamy, light-as-air cashmere, but this also makes it incredibly expensive. Find out how to tell good cashmere from the not so great here, so that you’re getting the best value for your money. Sleep-shirts have fallen by the wayside over the years, but luxe brands are starting to bring them back with a vengeance. These modern sleep shirts give you just the right amount of coverage without ever being too restrictive (after all, beauty sleep is a fickle, fickle lady) and the silk is luxurious and indulgent, but never too heavy. They’re the perfect option for summer sleeping, but these high-end shirts will cost you. Linen is becoming the new must-have fabric, on everything from sheets to sleepwear and even table linens. It’s a magical, all-powerful fabric that somehow keeps you cool in the heat and warm in the cold. This makes it the perfect option for full pajamas because it can help regulate your body temperature year-round, but quality linen can be incredibly expensive thanks to a difficult and temperamental weaving process. Linen can be difficult to adjust to at first because it can start off rough, but over time it’ll soften and become your favorite PJ set. Lingerie, as it becomes more trendy and accessible, is also becoming more and more expensive. It might seem counter-intuitive that such small and barely-there items can cost a small fortune, but creating quality lingerie is intricate and delicate work. Plus, when it covers so little, you want it to be made well! Look for quality detailing like hidden stitching, paneling, and pricey fabrics like silk, lace, and satin. Robes are so much more than just the fuzzy pink bathrobe your mom used to wear. They can be silky, delicate, cozy, short, long, with draped sleeves, kimono-style, and the list goes on. Robes can be surprisingly expensive, even when you’re looking for a basic white cotton robe, but they generally last you years to come with proper care, which makes them a smart investment. Slips have also come a long way since they were worn only under skirts and dresses. Now, slips are trendy with a vintage feel and they can be worn as both sleepwear and lingerie, which makes them incredibly versatile and another great wardrobe investment. Slips can be made from lace, satin, silk, or cotton blends, so it’s your choice as to what is most comfortable. It’s time to get ready for bed in luxury and style. If you’ve been looking for a way to treat yourself and take better care of your mind, body, and soul, then a pair of luxe PJs may be just the ticket — not just to a better sleep, but a better life. Writer and Blogger. My interests range from writing to fashion. I am also interested in design, photography, and travel.